Aberdeen Dental is pleased to offer tooth replacement that functions and looks like healthy natural teeth. The permanent tooth bridge in Vernon BC is a cost-effective and functionally effective way to replace a single tooth, or several teeth. Dental implants can be used to replace a single tooth, all teeth, or somewhere in-between. Designed similarly to the traditional bridge, implant bridges are a great option for those patients who either don’t have enough teeth or sufficiently healthy teeth to support a traditional bridge. These bridges get their support instead from dental implants. Made from strong, yet lightweight, titanium, the dental implant functions like a natural tooth root once it is placed in the jaw and fuses with surrounding bone. The multi-unit false teeth and crowns are anchored to the dental implants, the same way traditional bridges are anchored by abutment teeth. What bridge type is best for you? Call (250) 545 3319 to schedule a consultation. 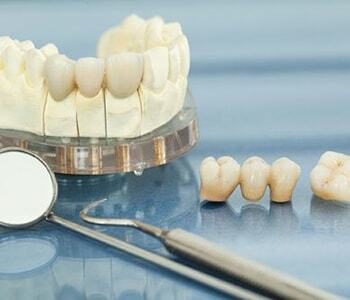 Regardless of how your teeth are replaced, Aberdeen Dental stands by its work with a warranty.